Lucky for us North Easterners we have tons of trees and an oncoming winter which together mean: fall foliage galore! While you can scour the internet looking for tips on where to find the best fall foliage, New York State's tried and true Shawangunks are the OutdoorFest recommendation for an easy, gorgeous and adventure-filled trip. Specifically, the hike to Gertrudes Nose offers some of the best (if not THE best) views in all of New York State. 1. As always: get your map! You'll want the NYNJ Trail Conference Shawangunk Trails Map which you can buy online at EMS or pick up at a local retail shop. 3. 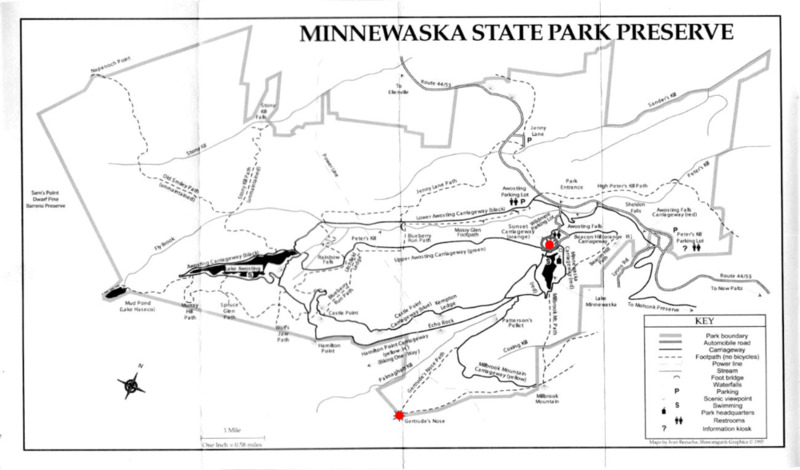 Head to Minnewaska State Park ($5 Cash for parking). 4. Go Explore! There are a ton of amazing trails and view points here but a relatively relaxed option is the hike out to Gertrude's Nose which takes you from the parking lot (red dot) along Lake Minnewaska, down the carriage roads and out the "red" trail to one of the most dramatic views in the Shawangunks (marked with a red dot below and pictured in header photo). 5. This time of year you'll probably see the pumpkin patches growing strong along the side of the road. Don't let the season pass by! Make a quick stop at Jenkins - Lueken Orchards to pick apples and stock up on pumpkins and other seasonal fare before heading home. That's it? Yes, it really is that easy. Now go outside!